Telling you what you need to know, not want you want to hear! Any business that wants to raise money, either from investors or lenders, needs to know how to attract them. I specialize in positioning companies to access funding. I spent nearly 30 years in international banking and 8 as a financial consultant specializing in helping companies raise funds. Never has my advice been so critical as it is today, when funding is so hard to come by. Part 3 of David Stacey International 3 Part Series on Raising Money for Your Business. Designed to help entrepreneurs and small business owners attract funds, Part 3 offers valuable insights on what lenders and investors need to know about you and your business. KEY TIPS ON ATTRACTING BANK FINANCE INTO YOUR BUSINESS. 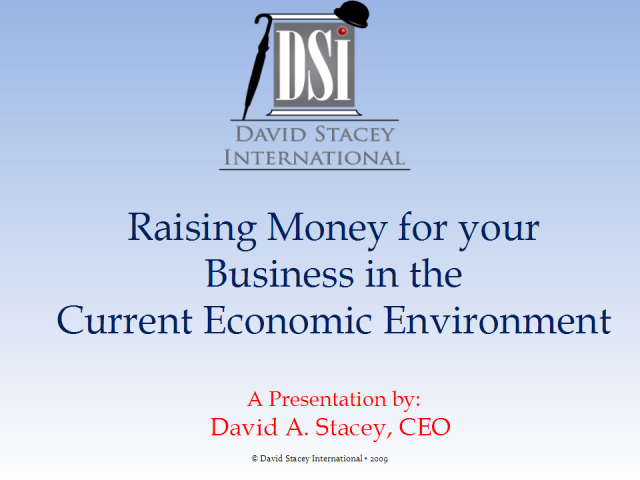 Part 2 of David Stacey International 3 Part Series on Raising Money for Your Business. Designed to help entrepreneurs and small business owners to raise money, Part 2 focus is on what you need to Know and Do to attract funds from banks and other lenders. Part 1 of David Stacey International 3 Part Series on Raising Money for Your Business. Designed to help entrepreneurs and small business owners to raise funds, Part 1 focus is on what you need to KNOW and DO to attract funds from Investors.